A day after a three-alarm blaze ripped through the iconic First Congregational Church in Berkeley, traffic routes continue to adjust, but churchgoers have found a temporary place of worship. The church's unstable brick infrastructure and an ongoing investigation into the cause of the fire prompted authorities to keep streets closed into Saturday, creating a traffic mess for fans driving to and from Cal's homecoming football game against the University of Utah Saturday evening. 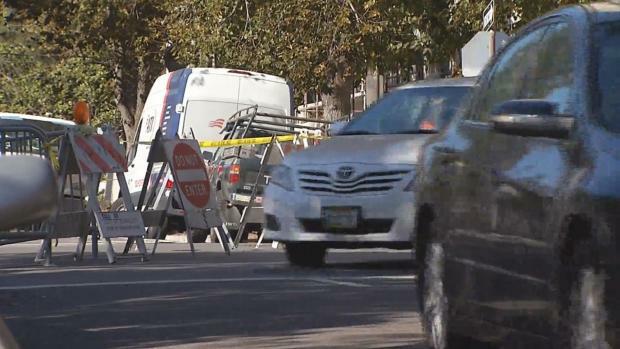 Authorities have since reopened Dana Street, a stretch of road that sits directly in front of the church's main entrance, but portions of Channing Way along the building's southern border remain closed. Although traffic will soon calm down, the lasting impact of the blaze has put a damper on churchgoer Sara Frucht's hobby. A day after a three-alarm blaze ripped through the iconic First Congregational Church, traffic remained snarled on the south side of the University of California, Berkeley campus just before a Golden Bear football contest. Laura Malpert reports. "My chorus, I rehearsed there for 13 years and I'm going to have to stop," she said. "That was actually our rehearsal space so it's very sad." But some friendly help is already being offered from a nearby neighbor. Just one block away, the First Presbyterian Church will open its doors Sunday afternoon for a service at 2 p.m. for those First Congregational Church worshippers who no longer have a place to go. A little bit of good news has also settled in for those in charge of operating the damaged church. The main sanctuary is yellow-tagged at this time and authorized personnel are able to step foot inside. "The sanctuary is in much better shape," church treasurer Moe Wright said. "Our pipe organ looks like it's in pretty good shape. That was a great relief to me." Officials do not know what caused the blaze to ignite and arson investigators do not believe that the fire was intentionally set at this point in the investigation.